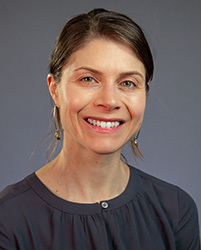 Courtney Tanenbaum, Ed.D. is a principal researcher with a specialization in postsecondary education research and evaluation. Her doctoral work focused on policies and practices that effectively expand access to college and promote more equitable opportunities and outcomes for the diversity of the nation’s students. Key areas of interest and expertise include dual enrollment and dual credit education; developmental education reform; broadening participation in science, technology, engineering, and mathematics (STEM); and institutional transformation. Currently, Dr. Tanenbaum serves as the principal investigator (PI) of a mixed-methods evaluation of the Bill and Melinda Gates Foundation’s Institutional Partners Frontier Set Network. This Network includes 29 two-year and four-year colleges and universities and two state systems simultaneously implementing a set of student success interventions including next generation courseware, integrated planning and advising systems, developmental education reform, and guided pathway; and developing capacities in the areas of leadership and culture, information technology, strategic finance, and institutional research. She also serves as the PI for a National Science Foundation (NSF) Alliances for Graduate Education and the Professoriate Broadening Participation grant, which takes a case study approach to explore Master’s to Ph.D. bridge programs for historically minoritized students in STEM and the cultural factors affecting program implementation and student experiences in those programs. Dr. Tanenbaum also serves as one of the co-PIs on an NSF-funded Louis Stokes Regional Center of Excellence partnership with Fisk University and Vanderbilt University. As co-PI, she is responsible for leading the team in researching, learning from, and disseminating information about the Fisk-Vanderbilt Master’s-to-Ph.D. Bridge Program to the Louis Stokes Alliance for Minority Participation (LSAMP) network and larger higher education community to support diversity and inclusion in STEM postsecondary programs. Dr. Tanenbaum also recently served as the co-PI on a study of dual-credit education in Texas which aimed to identify best practices in the implementation of dual-credit education programs and address concerns about their rapid expansion across the state, including the effect of this expansion on student performance and state education funding. Dr. Tanenbaum is a frequent speaker on panels and at conferences on the topics of broadening participation and issues of equity and access to promote the academic achievement of all students.